This combination was discovered by accident when I was repairing my bandmate's VOX Bulldog distortion pedal. I didn't like the Bulldog that much, however I got interested in its low-voltage tube design so I assembled a copy on a test bench. On its own it has provided very little overdrive, just as expected, but when combined with the Crate Flexwave preamp (my favorite solid-state distortion) it has completed its already great tone, giving it more fullness and presence. I've used this arrangement for rehearsals and some gigs and got complemented for the tone. Flextron goes a step further and accurately models a range of Crate solid-state amps powered by the Flexwave circuit. Every stage of the preamp signal path is carefully analyzed and modeled with the same attention to details as my previous SoftDrive GV and SoftAmp FM25 plugins. The Flexwave amp design has evolved over the years. I counted 6 different variations. After careful analysis, I've narrowed down the scope to 3 models. The one I've played with was made in the late 90's and I think it's ahead of the pack. However in 2000's they have changed the gain channel structure significantly and after some consideration I've decided to model all three. The Cooltron circuit in its turn stayed the same across their pedal range. I've tried a couple of different approaches to modeling it before settling on the final one. Since I've had a real physical implementation at my disposal I was able to successfully verify the accuracy of the digital model. Interestingly, both Flexwave and Cooltron follow exactly the same idea – they essentially are an asymmetric clipping stage biased by the low-passed feedback signal. Having made my own SoftAmp 3OD model I can say that this is exactly how a real guitar amp triode stage works. The main difference is that Cooltron uses a 12AU7 tube running on 6V anode voltage for the authentic tube waveshaping, while Flexwave relies on an asymmetrically configured "rubber diode" pair to achieve the same effect. In addition to the fully featured 3-channel preamp and a tube saturation stage, Flextron offers a dual-mode stereo reverb (algorithmic and convolution-based), a speaker simulator with two cabinet models and an ambience control (intended mainly for practicing in headphones), a switchable order oversampling and a set of visualization instruments, such as an EQ curve plot and stage bias meters. Just as with my previous plugins, every single control is remapped to produce linear response on a dB scale. Additional details can be found in the bundled manual. “Crate” and "Flexwave" are registered trademarks of LOUD Technologies Inc.
“VOX”, “Bulldog”, and “Cooltron” are registered trademarks of VOX Amplification LTD.
AXP is not affiliated with or endorsed by neither LOUD Technologies Inc., nor VOX Amplification LTD. The names are used only for reference and benchmarking. Greetings from Moscow! Awesome amp. I voted for you. I'm glad to hear that, thanks! 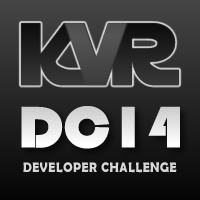 Awesome man!, you really know how recreate analog distortion in digital domain!, 5 stars for you in the KVR DC 2014 contest. thanks for following through man, you've made your best plugin yet! the hall reverb in particular is great for the Taurus vsti's lead type sounds. and it works great for sub-bass too. great work! Wow, thanks for such an emotional response! I'm glad you like it. I suggest lowering the oversampling ratio to 4x or switching it off completely (1x). It may be good enough for playing/mixing and you can always switch it back to 16x for the final rendering. I love sending drums through this plugin, it makes them sound like a bunch of gremlins bouncing around in a trashcan in the best way possible. Thank you! haha, what a description, I should name a preset like that! I love the Flextron! It's been my favorite preamp/amp/cab plugin since I discovered it. I have a request: my friend uses a Mac and he's a fan of the Flextron but is sad that there is no Mac version. How hard would it be to make a VST for the Mac? thank you, I'm pleased to hear that! I plan to release something completely new later this year that would be cross-platform. Depending on that experience I might redo all my plugins to work on Mac as well. Can't give you an ETA, or even guarantee that it will be done, but I hear you (and others) loud and clear on the Mac request. От всей души хотел Вас поблагодарить за потрясающую работу. Перелопатив за все эти годы тонны шлака, я так и не нашёл ни одного нормального софтового усилителя. Ваш - единственный! Мне нужно было в качестве основы хоть что-нибудь отдалённо напоминающее по звуку Bogner Ecstasy 101b. Ничего такого и в помине нет. Вокруг - сплошные жужжалки и перделки отвратного качества, независимо от того платные они или нет. Единственный "Bogner" - LeXtac от LePou -это жалкая поделка по сравнению с Вашим Flextron. Ещё раз - огромное Вам спасибо. Пожалуйста, продолжайте Ваш гениальный труд, даже если он не приносит желаемых дивидендов в виде финансов и человеческого отклика. С огромный уважением и наилучшими пожеланиями, Михаил. There's a blue "download" button under the effect screenshot. I recently installed this VST on my computer and have been using it through Ableton Live Lite 9, and I love it. It is by far my favorite amp plugin. But I just installed Reaper, and it is not showing up in my available VSTs'. Does it not work with Reaper? Or is there something I need to do. I really want to use this VST. It is the closest tone I have found for my actual Fender HRD3. Thank you very much for Flextron, it's hand-down the most easy to use, dynamic sounding amp sim I've ever tried. This has been my to go plugin for a few months now, far better than any of the overpriced commercial plugins. Hats off to you sir! work grate for bass as well!